The summer pavilion of Humayun’s half-brother, the city's oldest Mughal structure, stands in the middle of the riverbed. 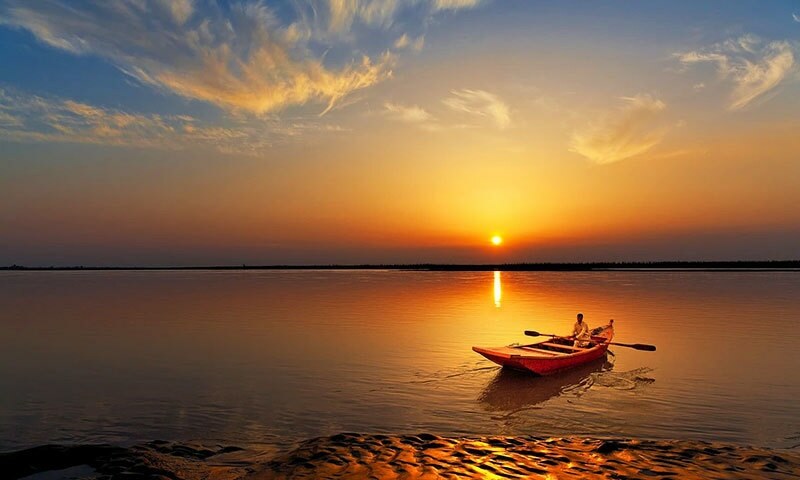 The Ravi river is a shadow of its former self as it runs past Lahore, which is sprawled on its eastern bank. Not really a river any more, it is but a filthy stream contaminated by the toxicants released into it from factories along the nearby Shahdara road. In the winter, the river looks even worse because its flow has been reduced to a trickle, making a mockery of the buttresses constructed on its banks to prevent flooding in the past. In fact, some nomads set up temporary camps on dry patches of the riverbed in the winter, confident that water will not displace them. As a child, I often wondered how the Mughals managed to construct this structure at such a convenient location. I later found out that the baradari, a typical Mughal pavilion, was constructed on the western bank of the Ravi, where it overlooked the historical city of Lahore. But the Ravi was once whimsical and powerful enough to change course at will. Sometimes full of wrath, it destroyed everything in its path. In one of its previous incarnations, the Ravi decided that the baradari looked better in the middle of the riverbed. Believed to have been constructed in 1540 by Prince Kamran Mirza, the younger brother of Emperor Humayun, the structure is said to be the oldest Mughal structure in this Mughal city of gardens. Others, however, have asserted that the current structure of the baradari could have been a later renovation, replacing the original building, perhaps on the orders of Emperor Shahjahan. Then, there are others who doubt if Kamran Mirza ever constructed a baradari here. 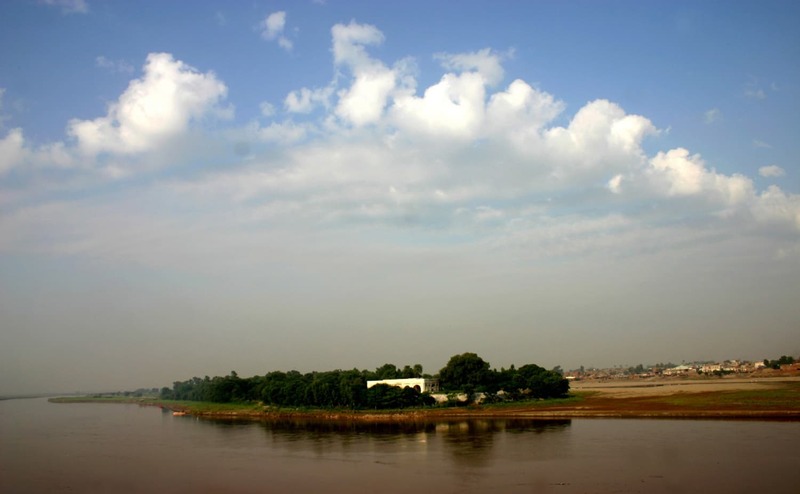 The baradari of Kamran Mirza stands on an island on the Ravi river. (Photo credit: Shaista Bukhari. CC BY-SA 3.0). Kamran Mirza was the half-brother of Humayun. When their father, Babur, died in 1530, he eyed the Mughal throne. While Humayun was away in Bengal, stabilising the empire’s eastern front, Mirza was assigned the job of keeping its western border secure. But he had other plans. Taking advantage of the situation, he established his suzerainty over Punjab, including Lahore. The baradari is believed to have been constructed around this time. Later, when Sher Shah overthrew Humayun and secured the Mughal throne for himself, Mirza is believed to have reached out to the Afghan king to offer him his loyalty for the right to rule Punjab. Shah turned the offer down. When Humayun eventually returned from Persia, where he had taken refuge, he fought Mirza and won. As punishment, and to prevent him from creating further trouble, Mirza was blinded and sent off to Mecca to perform Haj. A similar fate awaited Prince Khusrau, the eldest son of Emperor Jahangir, who had rebelled against his father. In fact, Jahangir was camped at this very baradari in 1606 when the rebel prince was captured and brought to him. Khusrau had nurtured the ambition to rise to the Mughal throne ever since the last years of his grandfather, Emperor Akbar. That was the time a middle-aged Jahangir, then Prince Salim, rebelled against his father and was defeated and humiliated. Akbar eventually forgave Salim. However, it is believed that the two never truly reconciled, with Akbar becoming increasingly close to Salim’s firstborn, Khusrau. It was even speculated that Akbar might bypass Salim and appoint Khusrau as his successor, considerably raising the political stature of the young prince. Backed by powerful nobles, Khusrau began seeing himself as Akbar’s successor. When Akbar died in 1605, Jahangir ascended to the throne and imprisoned Khusrau in Agra Fort. Khusrau rebelled and managed to escape. This eventually saw his capture and audience with the emperor at the baradari of Kamran Mirza a year later. Standing on the banks of the river, it is possible to see the golden dome of the smadh built in memory of Guru Arjan Dev, the fifth Sikh Guru, who was executed at that site on the orders of Jahangir for his alleged show of sympathy to the rebel prince. As punishment, Khusrau is believed to have been blinded later. He was eventually murdered by his brother, Prince Khurram, who later ruled the Mughal empire as Shahjahan. Khusrau was not the only one of Jahangir’s sons to rise up against him. Khurram rebelled too, but Jahangir defeated him and forgave him. However, Khurram chose to remain in exile in the Deccan for the rest of his father’s life. Khurram’s father-in-law was Asaf Khan, who remained part of the Mughal court, opposing his sister, Nur Jahan, who backed her stepchild Prince Shahryar, Jahangir’s youngest son, to succeed the emperor. 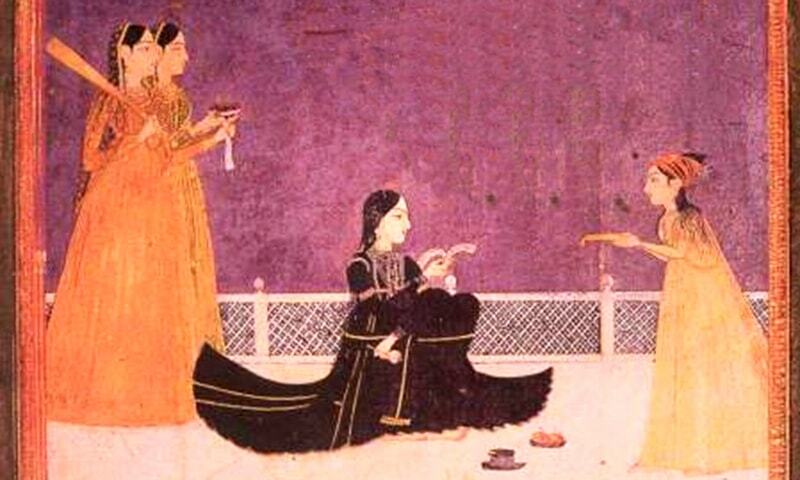 Shahryar was married to Nur Jahan’s daughter from a previous marriage. 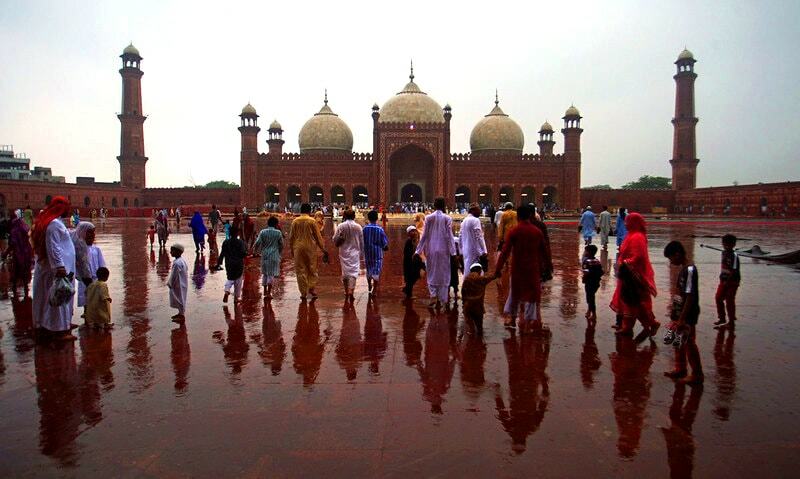 Once Jahangir died in 1627, Lahore once again emerged as the focal point of a bloody war of succession. Shahryar, backed by Nur Jahan, declared himself emperor at Lahore Fort. With the royal treasury under his control, he had an advantage over other claimants. But Asaf Khan outmaneuvered Shahryar. As Prince Khurram undertook his long march from the Deccan to claim the throne, Khan propped up a puppet – Dawar Baksh, Khusrau’s eldest son – as emperor. What followed set a new precedent in the Mughal wars of succession. On January 23, 1628, on the orders of Shahjahan, Asaf Khan executed Shahryar, Dawar Baksh and any other Mughal prince who drew a direct lineage from Jahangir. While there were two other brothers in that war of succession, the final battle was between Dara Shikoh, the emperor’s favourite, and Aurangzeb, arguably his least favourite. Dara Shikoh was the governor of Lahore when Shahjahan fell seriously sick, triggering the war of succession that was to engulf the entire empire. Aurangzeb defeated Dara Shikoh and executed him in 1659, while Shahjahan was imprisoned till his death in 1666. Just behind the smadh of Guru Arjan in Lahore are the tall minarets of the Badshahi Masjid that were constructed out of sandstone tiles. As Lahore governor, Dara Shikoh had brought these tiles from Jaipur to construct a pathway from Lahore Fort to the shrine of his Sufi mentor, Mian Mir. After Dara Shikoh was executed, Aurangzeb constructed a mosque with those pink tiles. Yes I have seen this Mughal Monument, ... sadly, Mughals were busy building palaces to enjoy their private lives while West was building Universities and Institutions to build their future Nations. @Saleem Chandasir - In the West they were not just building Universities, the royal palaces there are even more grand and stupendous than what you see here. Mughals were brutal. They did not even created a proper succession process. Extremely interesting. Keep posting such stories at least one a week. History is needed more now than anytime to learn correct lessons. Present day Pakistan is no different , it is simply an extension of those times. I always wait for Haroon's article .. because of his writings i think i am falling in love with our history .. Very informative article. At the same time, it is sickening to read the blood shed that occurred in the family of so called "the Great Mughals". Superbly written article. We need these on regular basis. They can be on any other topic but should relate to Subcontinents history Pre-British era. I recommend you make it a series. Like the one after independence which is already complete. Nice, accurate and informative. Moguls created art, music and culture in this region and gave us an identity. Thank you for this article. @Saleem Chandasir I disagree. These moniments are looked upon with pride and wonder. Also, who is stopping you from building world class universities now?